I confess: I don't often tell my liberal Berkeley friends that I have listened to Glenn Beck. Recently while eavesdropping on one of his videos, I found myself wondering which was more astonishing: Beck’ s arrogance or his breathtaking historical ignorance. I decided it didn’t really matter, as the two factors work synergistically to create a monument to mendacity, an apotheosis of the absurd, a smorgasbord of simplistic sound bites. Glenn Beck’s mind is a labyrinth of illogical inferences, historical blunders, and moral contradictions. When he opens his mouth, they all come buzzing angrily forth like malevolent spirits pouring forth from Pandora’s box. Let me take two examples from this video. It’s also interesting to me that we’re the ones being compared to the flat earth believers. Yet, if you know history—I mean the basic rudimentary history—you know the word ‘Galileo,’ the man who fought against the power structure of his own time to enlighten mankind that the earth wasn’t flat. And that the sun, not the earth, was the center of the solar system. Beck is completely ignorant of that fact that not only did Galileo not “enlighten mankind that the earth wasn’t flat,” but that, in fact, no educated person in Galileo’s generation believed the Earth to be flat. Since the sixth century BCE, thinkers of the stature of Pythagoras, Aristotle, Euclid, and Aristarchus had observed that the Earth is spheroidal (we now know it is technically an oblate spheroid). Jeffrey Burton Russell notes that although there were a few dissenters—Leucippus and Democritus for example—by the first century AD the sphericity of the Earth was accepted by all educated Greeks and Romans. In the Christian West after the fall of the Roman Empire, the story was the same. The number of respected Christian thinkers who denied the sphericity of Earth—by misinterpreting passages such as Ps. 104:2-3 as geographical rather than metaphorical—can be counted on the fingers of one hand. In contrast, tens of thousands of Christian theologians, poets, artists, and scientists assumed the spherical Earth view throughout the medieval and early modern period, and no educated person believed otherwise. Indeed, Columbus sailed on his voyage of exploration precisely because it was common knowledge that the Earth was spherical; although he miscalculated the distance to Japan, he was correctly following 2,000 years of precedent in assuming that the Earth was spherical, not flat. Thus Glenn Beck—in berating Bill Nye for cautioning against the teaching of creationism—shows his own profund ignorance of history. It was those who held power that tried to shut him (Galileo) down..Just as those who are in power now try to shut up all who disagree now. What does Beck not understand about this conspiratorial cut-and-dried comparison? 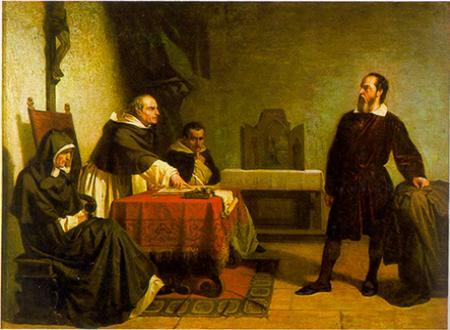 The Galileo affair was far more complicated than Beck’s cartoon version implies (for a nice summary see Hess and Allen, Catholicism and Science (pp. 41-49)). More egregiously, Beck swaps his opposition to science with Galileo’s defense of science; while Galileo argued for heliocentric astronomy, Be ck argues against evolutionary biology. It is Beck who stands in resolute antagonism to the rational investigation of the world, a posture quite opposite to that of Galileo. Glenn Beck plays the court jester in the throne room of the kingdom of antiscience—a menace to rational thought and especially to science. Yet he is very popular; even after leaving Fox News he managed last year to rake in $90 million in profits. Let’s hope that in tomorrow’s debate with Beck’s fellow conservative Ken Ham, Bill Nye can set the historical and scientific record straight.